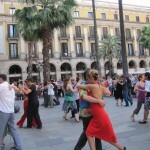 Barcelona is a hot spot for tango tourism. The city attracts not only with its cultural life, historical centre, the palaces of Antonio Gaudi and an exquisite Spanish cuisine, it also persuades tango dancers with its diverse offers of tango events. Now a special city guide called RUTA DEL TANGO EN BARCELONA gives an overview over the vibrating tango culture, including tango concerts, tango festivals, tango clothing boutiques, milongas and other venues interesting for tango lovers. On the UP-Tango website you could read about the tango project already in February. In March ten thousand copies were distributed in bars and shops of Barcelona’s city center. The tango guide is also online for download. 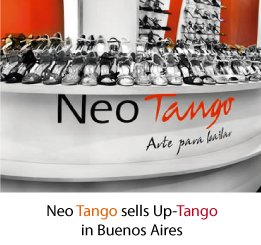 As local label for individual tango clothing, dance wear and elegant tango dresses, also the show room of UP-Tango is listed in the guide RUTA DEL TANGO EN BARCELONA. Here tango dancers and tango lovers will find what they need: beautiful tango dresses, dance pants, tango skirts and all other kind of dance wear and tango clothing. Visit the UP-Tango show room in Barcelona or find the whole collection of dance dresses in the UP-Tango Online Shop.